In the fall of 1989, Coach Myron Schroeder set out to find enough 15-and-under talented pieces to participate in the 1990 USSSA Youth World Tournament. Over the next five-month period, 12 pieces of talent were accumulated from six different central Illinois high school baseball programs. It was his intent to put together a team that just might win a game at the tournament. Not in his wildest dreams did he imagine he was constructing one of the finest boy’s youth softball teams ever to play the game. With a willing sponsor in Jim Fox of Fox’s Sports, the team had a uniform sponsor and a team name, but little else to support what was on the horizon for these 12 untested softball players. As these dozen players arrived at the World Tournament’s opening ceremonies, one had his leg in a cast and two others were wrapped in bandages and tape, while the entire team noticed they were the smallest team in stature compared to the other 25 competing teams. Even though outsized, it did not seem to deter the team’s spirit and desire to do their best. Their goal of winning a game remained intact as they took the field for their first World Tournament test, despite hampering injuries to key personnel. Their wish of winning a game was soon answered as they a 15-3 win over the Milwaukee Scrubs. Three hours later, they rolled to their second win of the day with an impressive 13-5 decision over Sheboygan. Even though they had won by wide margins, no one game them much of a chance in their final first-day contest against the number two ranked Eastlake, Ohio squad. Everyone continued to literally overlook the little team from Illinois, but it only took three innings and a quick 9-0 lead against the highly regarded Ohio team to begin to turn heads in their direction. At the game’s conclusion with a 9-3 Fox’s victory, it was evident there was now a Fox running alongside the tournament’s big dogs. After the opening day fray, a couple other players got a little dinged up, adding to the count of limping teammates. This, however, did not affect how the team played on day two. They continued three quests through the field of giants with two more impressive wins. On Saturday evening, a Fox’s team every expected to be heading back home following Saturday’s play were forced to find evening shelter at Milwaukee’s famous “Roach Motel.” Their stay at this quarter star lodging facility seemed to toughen the team even more while the majority of the team spent their time pushing their cast-laden teammate up and down Milwaukee Avenue in a grocery cart borrowed from a nearby K-Mart. It was evident the team’s focus remained on having fun together and the pressures of competition seemed non-existent. Championship Sunday began with a thunderstorm which pushed back tournament play by four hours. When play did resume, the Fox’s responded in the tournament’s winner’s bracket final with a very impressive 19-3 victory over a long ball hitting Minnesota squad. This victory set up a championship match against the favored number one ranked Sylvester, Georgia Flyers, who had won the last six World titles. By design, knowing the Flyers would have to defeat the Fox’s twice to take the title, Coach Schroeder pulled in his outfield after getting behind early in the contest. This allowed the Flyers to hit the long ball at will and run the bases like it was a track meet. Following their 22-6 (five inning) victory, the Flyers celebrated while the Fox’s strategy of lose-the-battle-win-the-war was only beginning to take shape. At a quiet team gathering, the Fox’s were informed they had one more chapter to write in their unfinished book. This seemed to provide a new motivation. They jumped on the Flyers early, and after running out to an 8-1 lead after three complete innings. The Georgia quad was not ready to throw in the towel, coming back to within one run after six complete innings. With the Fox’s hanging by a thread, the top of the seventh inning saw the Flyers manufacture three runs to take a 14-12 lead. The Fox’s came to bat, knowing their dream of becoming World Champions rested upon plating at least two runs. It appeared the Fox’s were not done with Rob Teno leading off the last frame with a triple, but a ground out and a caught infield line drive created a chorus of Georgia faitful to begin singing, “Hey, Hey Good Bye.” Their singing was quickly muffled, however, by a RBI double by Matt Stiger and a tying run single by Matt Gregory sent the game into extra innings. In the top of the eighth inning, the Flyers threatened to win, but a tremendous throw from left center fielder Dusty Johnson cut down their potential leading run attempting to advance to third base. As the team arrived at the dug out, they realized they were on the verge of something special. When the inning’s leadoff batter, Chris Kirby reached on a base hit over the Flyer shortstop, the team began to believe it was their moment. Roger Freeze quickly rapped a double, moving Kirby to third base. With the winning run only 60 feet away, Jesse Huisinga delivered a game-winning sacrifice fly to left field, scoring Kirby and Illinois’ first youth World title. At that moment, all the doubters realized they had forgotten to measure this small team’s heart and they celebrated the unexpected championship. To this day, Coach Schroeder says it was perhaps his most rewarding softball win, emphasizing the Fox’s team was the most coachable team he has ever been around. “They are truly a special group that won a World title together,” he said. In the mid-1970s, Gloria Kolbusz, a 2001 Illinois USSSA Hall of Fame inductee, was managing a 16-inch softball team, but they were looking to get into some 12-inch softball. She soon found the Northeastern Illinois Women’s Slow Pitch Softball League, which featured some of the best women’s softball teams in the area. Wanting to push themselves to the next level and see where they measured up against the best competition available, they were soon looking beyond the Chicagoland area. The Chicagoans began play in ASA softball, but because the tournament set up was not to their liking, they moved to the USSSA. Now they found themselves matched up against powerful national teams such as Little Caesar’s out of Detroit, Michigan and Cincinnati Knights of Columbus, Ohio. They finished as high as eight nationally and were always ranked in the Top 20, mostly due to solid defense and powerful hitting. During the 1980s, the Chicagoans traveled all over the nation, which included many tournament stops in Rockford. The line up consisted of players like Illinois Hall of Famers Mary Malpede, Karen Foley and Jan Wilson, along with Mary Pat McGuire and Mary Schaeffer. 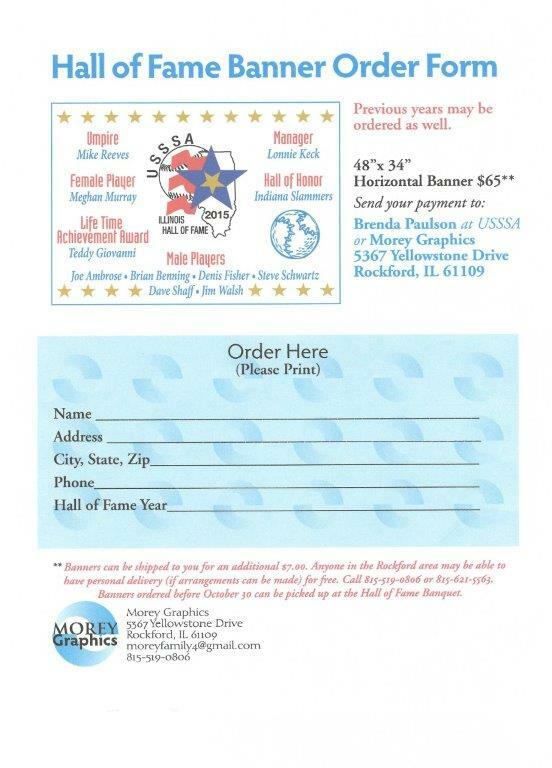 Malpede, a 1999 Illinois Hall of Fame inductee, won over 500 games from the pitching circle and appeared in ten USSSA Class A World Tournaments. Foley, a 1996 Illinois Hall of Fame inductee, was the first female to hit a home run over the year-old 250’ fence at Forest Hills Diamonds. Wilson, a 1999 Illinois Hall of Fame inductee, was a career .557 hitter with over 200 home runs. In 1982, the Chicagoans won their first of three Illinois Class A State Championships and pulled the trick two years later by capturing the championship in 1984. In each championship, Foley was named the most valuable player and Wilson was selected to the All-Tournament Team. Although the team changed their name to C.M.C., they were still just as tough and were Class A champs in 1988. During those years, the Chicagoans, along with the Lassies and Coors Light, were always among the favorites. Tonight, we honor a team that pursued the goal of being the best and playing the best they could. Great teams take more than one great player and have to have a smart and creative manager. The Chicagoans met both those attributes for many years. And for that, Chicagoans, the Illinois USSSA thanks you.